On 29 January, a unanimous general assembly decided to welcome VTI, the Swedish National Road and Transport Research Institute, as a member in f3. VTI is an independent and interdisciplinary research institute and also an assignment-based authority under the Ministry of Infrastructure. The institute has a broad competence profile and carries out applied research and development in relation to all modes of transportation. 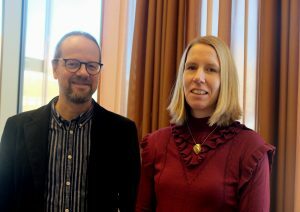 Mikael Johannesson, Research Director, and Kristina Holmgren, researcher, will represent VIT in f3. Mikael Johannesson and Kristina Holmgren, VTI. Photo: Emmi Voogand, f3. Why does VTI want to become a partner in f3? – A central task for VTI is cooperation with academia within our field of research, Mikael Johannesson explains. We do that by taking part in different competence centres and collaborative networks, in Sweden as well as internationally. From that point of view it seemed very natural to join the f3 network as well. We believe that f3 is a great platform for collaboration with other research environments, and to improve the knowledge on renewable transportation fuels together. What are the hopes of VTI from being a part in f3, and what will be VTI’s contribution to the centre activities? – VTI has staff members that are researchers in a wide range of disciplines, for example behavioural science, transport economics, political science and engineering. The interdisciplinary perspective is of key importance. In this way, there are several similarities between the work of VTI and the five research areas of f3, says Kristina Holmgren. Prior to working at VTI, Kristina was part of a number of projects and activities within f3. That made the connections between VTI and f3 very transparent to her. She hopes that the partnerhip will result in new collaborations and that knowledge and research results can reach a wider target audience. Mikael and Kristina believe that VTI will contribute to f3 by widening the centre’s knowledge and experience platform. The fact that VTI is an authority with experience of assignment-based work for the government could also be an important dimension for f3. f3 are happy to welcome VTI and look forward to a productive collaboration!